DCanes | Long canes for the blind and visually impaired. Your source for rigid Long canes for the blind and visually impaired. Our Canes are for Mobility and are not support canes. OUR CANES are Built for strength and long life. 4.Painted with quality white reflective paint. 5.Durable straight 7 inch handle. 6.Looped bungee to hang cane. I would like to introduce myself. My name is Don Fidone, owner of Dcanes. We produce and sell high quality light weight rigid white canes at a reasonable price. We are in the process of designing a light weight quality folding cane. We hope to have these into production by the end of 2019. Our goal is to take over where Bob Riley left off and expand the company. With the growth of the company we hope to employ blind and visually impaired workers. I myself am visually impaired. The rigid canes are made from a high-quality wound fiberglass and come with a metal glide tip. We can custom make the cane from 54 to 65 inches. 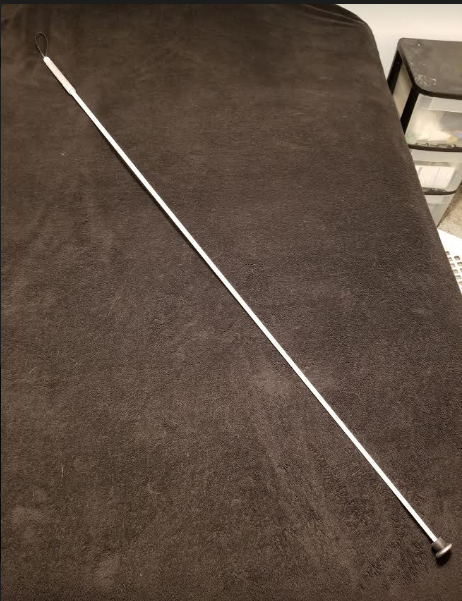 I hope the next time you go to purchase a rigid long cane, that you’ll consider dcanes. We are confident you will be satisfied with your purchase. Please share this website and information with anyone you know that may benefit from our light weight canes. Please specify your length, number of canes when ordering. Canes can be ordered on our Contact order form by clicking the button on the bottom of this page. Payment can be received using Pay Pal, check or money order. I will send a Paypal invoice after confirming your order with you. Thank you for visiting Dcanes All feed back is greatly appreciated.